The rose, magnolia, gardenia, peony, and hydrangea would be at the top of my list, but I don't think I could pick just one. I enjoy bringing fresh flowers in from the garden to use in arrangements. It's also nice having flowers that don't need to be watered and changed out every few days. So what's the next best thing to fresh from the garden? Silk flowers that look real! 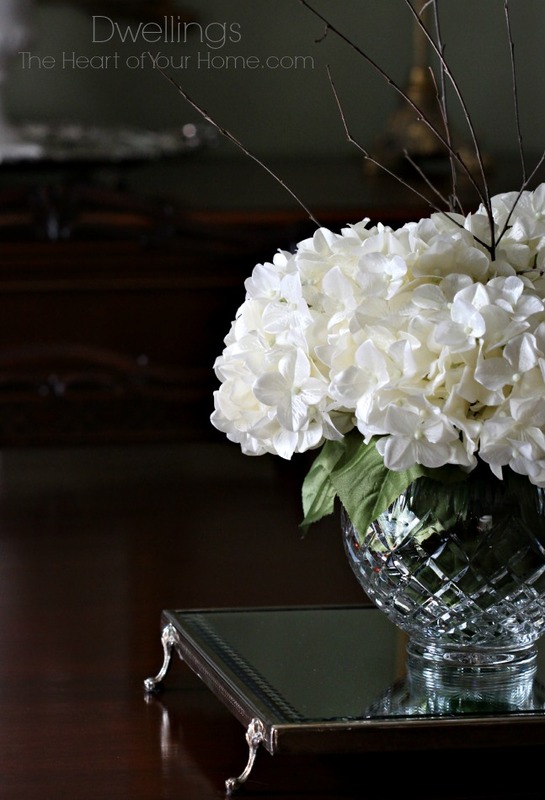 Some faux flowers leave much to be desired, so it's worth it to invest in quality silk flowers. They look real, last a long time and you can use them in different arrangements time and time again. To make this arrangement the first thing I had to decide was the flower and color. 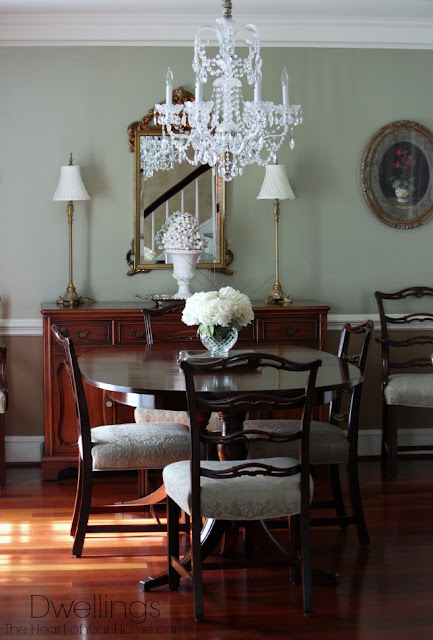 The formal dining room has soft shades of green and gold with mahogany furniture so white may have been too stark and cream a little dull, so I chose six silk hydrangea in the color pearl. My next decision was the vase. The hydrangea stems were very long with several leaves on each. 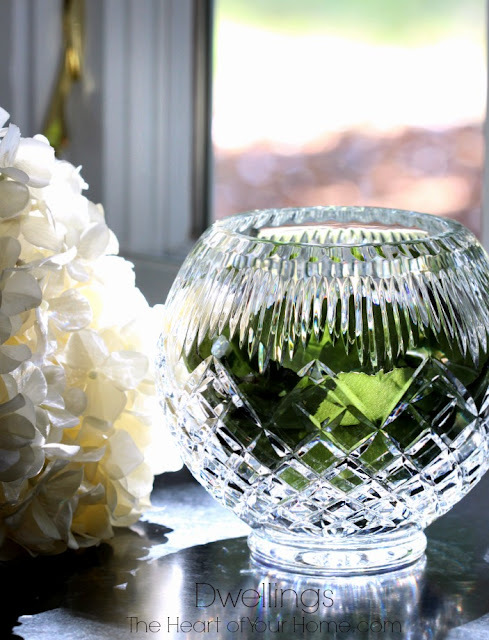 I cut the stems to fit in a small crystal vase and by taping the extra leaves together; I was able to curl them around the inside of the vase to conceal the hydrangea stems. After bunching the six hydrangeas together and securing the stems with a rubber band, I placed them in the vase. It was pretty, but I wanted to add a little something else, so I headed outside for twigs. 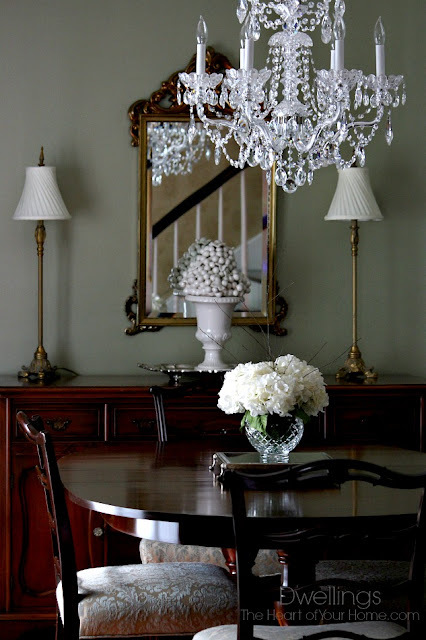 Once the twigs were added, I placed the new dining room centerpiece on a mirrored plateau. The centerpiece turned out just as I hoped. Cheerful, not too large, simply elegant. 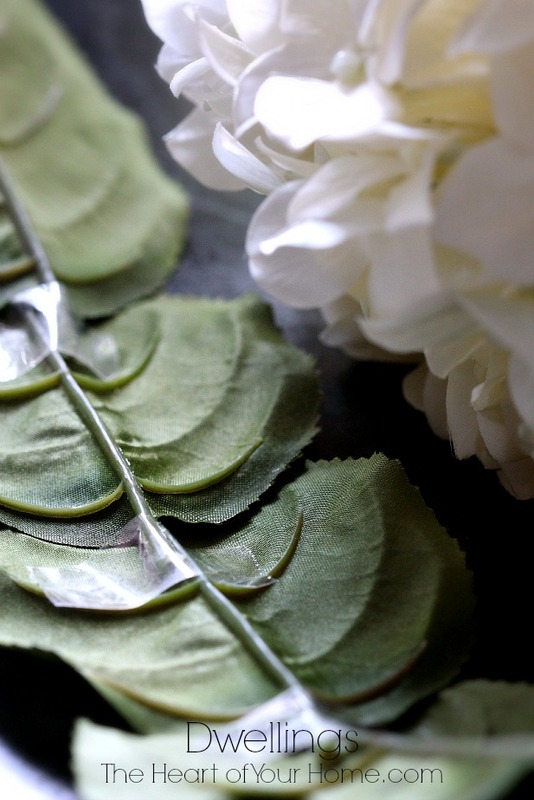 The petals have a bit of texture and shimmer...just beautiful! I love the dining room as the sun is setting, when light colors and the crystal chandelier begin to shine. When asked to preview silk flowers from Silk Plants Direct, I was surprised by all the options; flowers, centerpieces, wreaths and so much more. Hop on over for a peek and should you find something you like they are offering my readers a 10% discount on ALL their products! Just use the code "BLOGGER10". 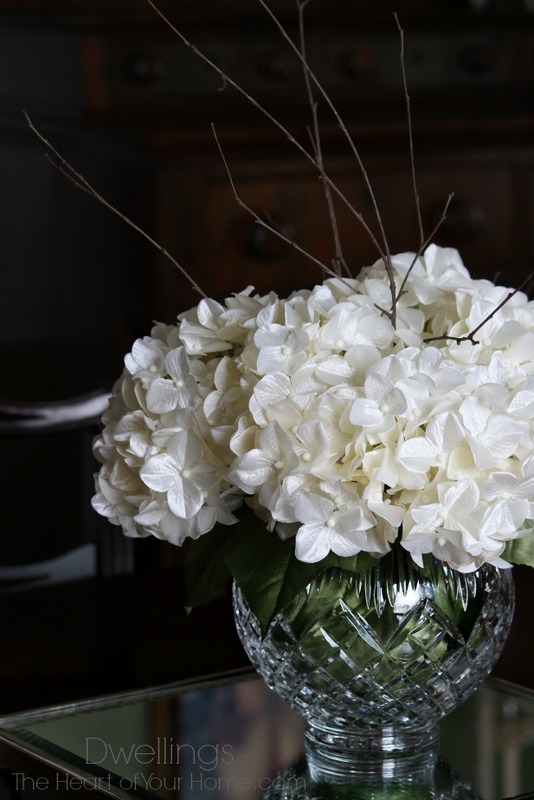 The hydrangea I chose came in a pack of six: Hydrangea Spray - Pearl. Don't miss this week's features and inspiration at AMAZE ME MONDAY! So beautiful, Cindy. I love hydrangeas. Cindy, Your flower arrangement is beautiful. 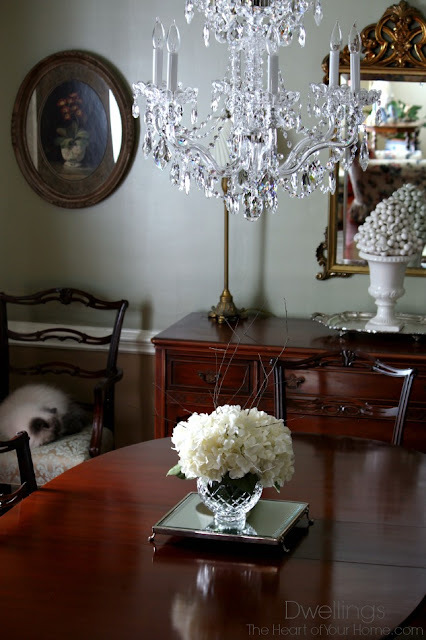 I use silk flowers in my home too and over the years like silk gladioli the best. The ones I have have faux water droplets on them and people visiting have thought they were real. Thanks for the heads up on the sale. I'll be checking it out! AND you forgot lilacs and Pink Impression tulips! :) Your home is beautiful! I love the simplicity of your center piece. You dining room is exquisite Cindy! 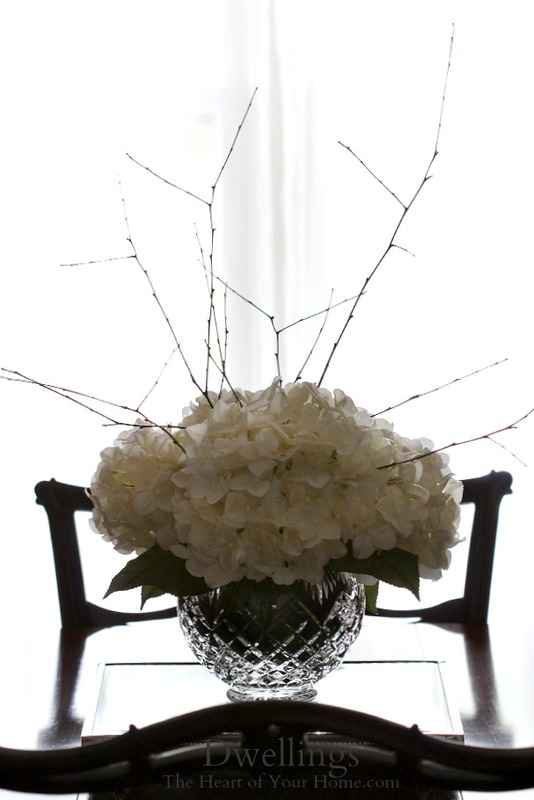 Cindy, the silk hydrangeas look amazing! 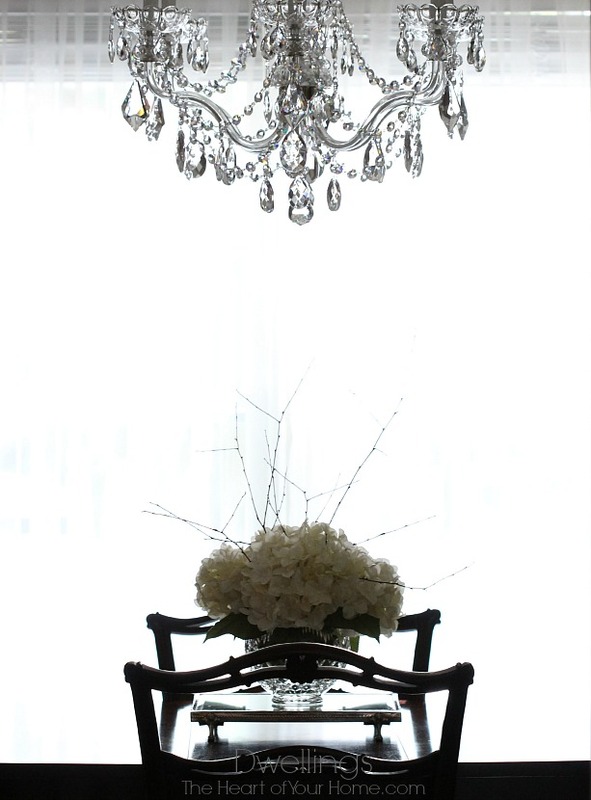 Your centerpiece is beautiful under the chandelier and the light coming in makes for a beautiful setting! 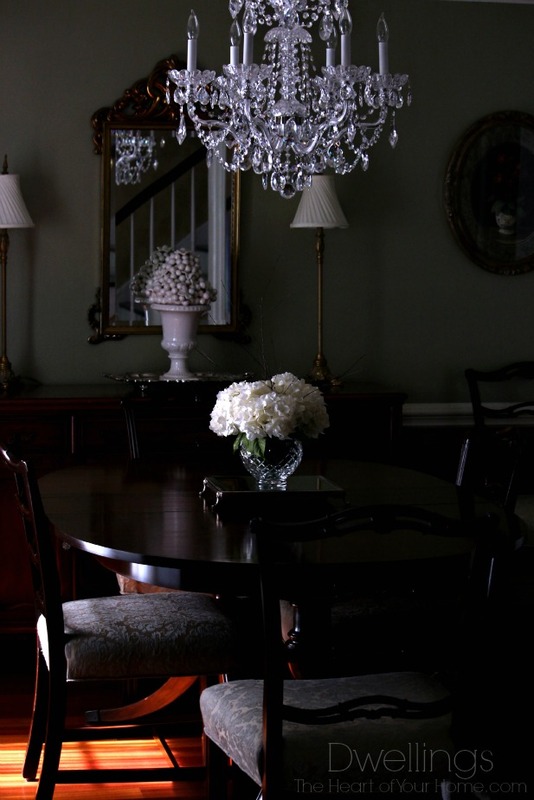 Your centerpiece is so lovely, Cindy, and just suits your dining room very well. Very nice and I love the vase. Cindy, your arrangement is so simple and beautiful. You know I've only recently rediscovered faux flowers. Some are so much better than others but when they are good....well they are wonderful! I adore your choice of flower and the crystal vase!!! My favorite flower is the Sunflower!!! A close runner~up is a Rose!!! 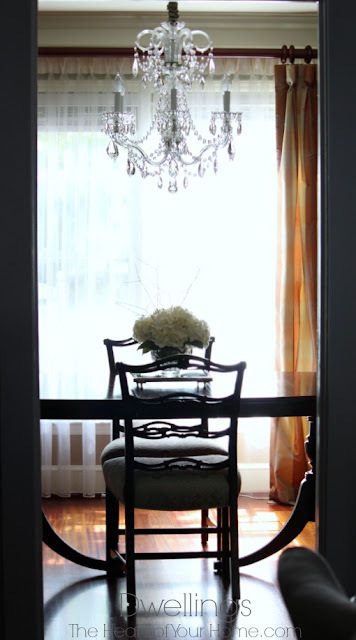 Thank you for sharing your elegantly designed and style Dining Room decor, dear friend!!! Always inspiring @ Dwellings~The Heart Of Your Home!!! I adore fresh flowers from the garden so much that I just posted about my first summer flower garden bouquet! 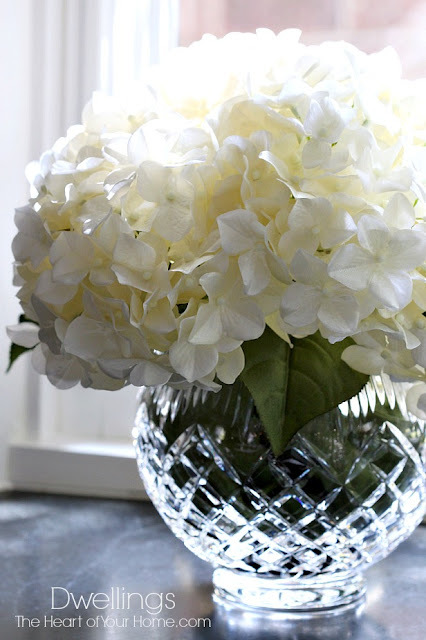 I also blog about my hydrangeas all the time! 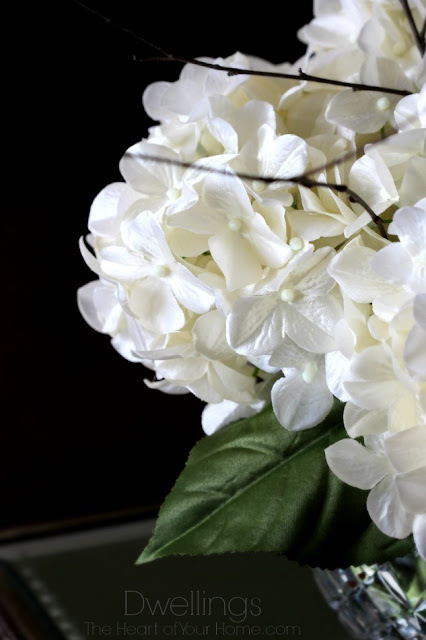 But silk flowers have gotten truly realistic and beautiful and I love your choice of white hydrangeas. They compliment the room beautifully.